Color:Red Micro Color:Red Micro 4 pack Micro USB in assorted lengths(3 ft. 6 ft. 6 ft. 10 ft.) is the ideal length for usage at home, in your office and more places,Compatible with Android and Windows phones, tablets and many other devices including Samsung, Nexus, HTC, Motorola, Nokia, LG, Sony, One Plus, Blackberry, PS4, Kindle, Xbox, PS Vita, Nintendo DS, GPS devices, battery packs, Bluetooth speakers, wireless keyboards, cameras, camcorders, games consoles, hard drives, e-readers, printers. 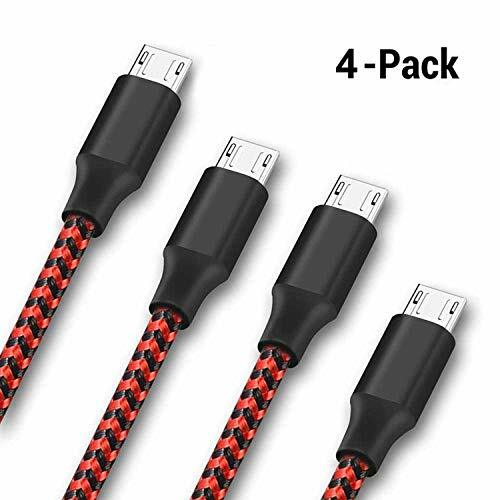 4Pack Micro USB charging cable Distinguish Features High quality Braided-nylon fiber jacket and aluminum shell enhances the durability and safety. We tested the lightning cables to 95-degrees 2,000 bends and saw no damage or problem happen. A large diameter of power wire speeds up battery charging. Perfect Length Assorted Lengths of 3ft 6ft 6ft 10ft are applicable to many cases, in bed, sofa, kitchen, car, office and travel. Compatibility Perfectly compatible for charging and data transfer with the entire Android family: Samsung Galaxy Smartphones Android Phones from other Manufacturers like Motorola, Huawei, Google, Blackberry, Kyocera, LG & HTC Most Android Tablets like the Samsung Tabs and the Amazon Fire PS4 & Xbox Controllers Power Banks or Portable Batteries Portable or Bluetooth Speakers Digital Cameras and Camcorders Electronic Cigarettes Any other device that charges through a micro usb cable Package included 4x Micro USB charging cable - 3Feet 6Feet 6Feet 10Feet Warranty and Service: 12 months worry-free product guarantee from OfsPower which ensures long-lasting enjoyment of your purchase.Plz don't hesitate to contact us if any questions or problems!